A powerful mix of people represented the United States Agency for International Development (USAID); the World Bank; the United Nations International Children’s Emergency Fund (UNICEF); Ministries of Education; disabled persons’ organizations (DPOs); and self-advocates. The goal of the technical learning session was “to increase knowledge of effective disability inclusive education policy, planning and practice among donors, government and civil society in Africa in a manner that promotes cross-regional sharing and coalition building.” This was the first time in history that USAID, the World Bank, and UNICEF joined forces with joint funds to focus on inclusive education. It was even more historic that it took place in Nairobi with a specific focus on countries in sub-Saharan Africa. The conference showcased women wearing colorful dresses and headwraps, promoted countless multilingual conversations, and amplified a strong message of education for all. Elizabeth Kamundia of the Kenya National Commission on Human Rights put forth a compelling message of inclusive education informed by disability studies and human rights frameworks. Fatma Wangare, a parent of a young woman with an intellectual disability and CEO of the Kenya Association of the Intellectually Handicapped (KAIH), spoke forcefully against the oppressive nature of standardized testing and its role in creating and maintaining segregated schooling. The stage was set for a critical look at international approaches to inclusive education in an incredibly complex and fascinating region of the world. Meals offered an opportunity to learn from the conference participants about the realities on the ground facing inclusive education in sub-Saharan Africa. Too often these learning events do not have much applicability to people doing the work in real schools with very few resources. At events like this conference, there tends to be a lot of talk about “aspirational policy” and not a lot of on-the-ground applicability that actually translates to better outcomes for people with disabilities who are literally fighting to survive on a day-to-day basis. To the credit of the organizers of the Nairobi meeting, they created a space where these challenges were taken on by a diverse group of stakeholders in education. A young boy with polio who lives in a hut and uses a modified hand crank bicycle to move around the rocky dirt street. A mother of six children, one of which has cerebral palsy. The mother contracted HIV after sleeping with a fisherman without a condom in order to purchase fish at a slightly lower price. A 16-year old young man with Down syndrome who has never been to school because of the stigma associated with disability in his village. What would these people have to say about inclusive education had they had the privilege of attending this conference? How do we ethically and practically balance the on-the-ground struggle for survival of people with disabilities in these countries while operating within extremely large organizations like the USAID, the World Bank, and UNICEF? That is the task at hand. 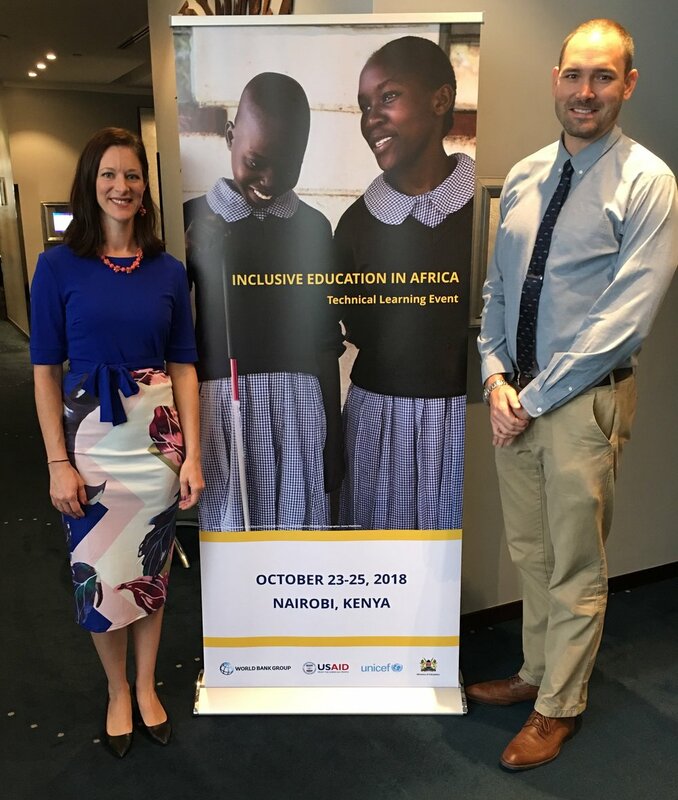 Leah Maxson of USAID (left) and Brent Elder of Rowan University and Tangata Group (right) standing in front of a poster that reads, "Inclusive Education in Africa: A Technical Learning Event." Brent Elder's conference name tag that reads, "Inclusive Education in Africa Inclusive Learning Event, Dr. Brent Elder, Rowan University/Tangata Group, United States of America" with the logos of the World Bank, USAID, UNICEF, and the Kenyan Ministry of Education. Image 3: Brent Elder of Rowan University and Tangata Group (left) stands with Benson Oswago of the Ministry of Education in Kenya (right). Anne Musalia of the Kenyan Ministry of Education, Quality Assurance and Standards (left), Fred Haga, the Kenyan Deputy Director in the Directorate of Special Needs Education (second from the left), Brent Elder of Rowan University and Tangata Group (third from left), and Lydia Chege the Deputy Director of Finance and Administration of the Kenya Institute of Special Education (far right), pose for a photo. Brent Elder of Rowan University and Tangata Group (left) and Fred Haga, the Kenyan Deputy Director in the Directorate of Special Needs Education (right) pose for a picture.